One of the more fascinating native orchids is Gastrodia sesamoides. Although it is never, or very rarely, offered for sale it is common and will sometimes appear in gardens that in close proximity to forested areas. Its growth habit is unusual, and its flowers attractive. Also known as Cinnamon Bells, Gastrodia sesamoides is a saprophytic orchid that is commonly found growing in forested areas in Victoria, Tasmania, South Australia and New South Wales. 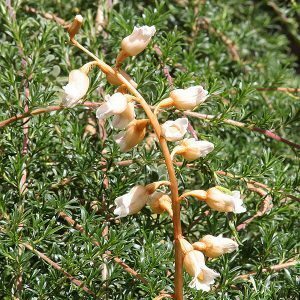 The cinnamon coloured bell shaped flowers appear in late spring to summer. They appear on tall stems to nearly 1 metre in height. These orchids are leafless and grow from an underground tuber. They are not a plant that is easily transplanted and are difficult to cultivate. These interesting plants are brown in colour all over, they have no chlorophyll and grow on fungus in decaying matter beneath the surface. Very little is known about the complex growth habit of this saprophytic orchid and its relationship the the fungus that it relies on to survive. If you are lucky enough to find one growing in your garden, leave it undisturbed and do not attempt to transplant. These are a self pollinating orchid, and can produce seeds, however propagation from seed is very difficult.